Artful Affirmations: It is that Spooky Time of Year! what a great idea for these terri....i have two packages of them right now in my table. these are beautifil! I am not a halloween fan either. But I think it is fun for children to disguise... some years ago it was something new and quite a hype in France, it was amusing to see the children having fun, and I bought loads of sweets...but the last two years the children just ring and ask for sweets without being disguised, that's not funny!! So I tell them they'd better get the right dresscode otherwise I will give them a treat!!! But it is more an American tradition. In the Neterlands we have a similar tradition, Sint Maarten, in France we have Carnaval in some regions. 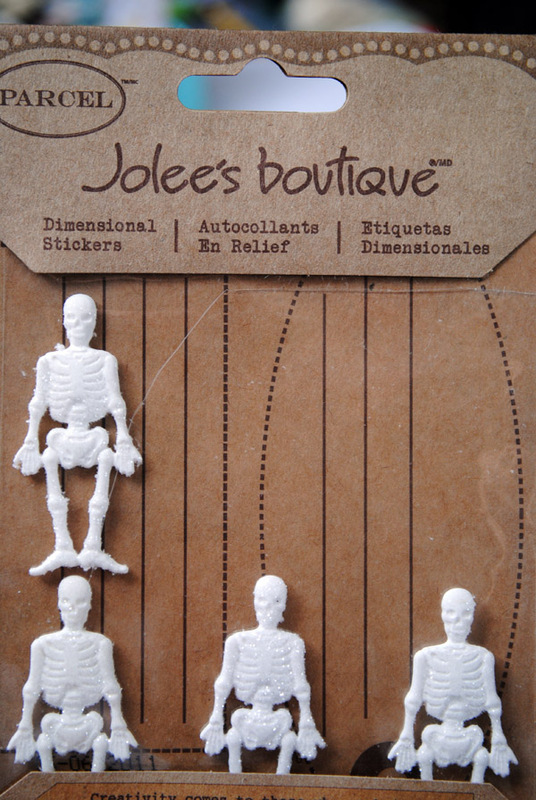 Ooh, they are perfect for Halloween! I have a confession: we turn out the lights, grab a book and head to the back bedroom on Halloween. Mostly 'cuz giving candy to kids who are TOO old to trick or treat is just not right. The little ones go into town during the day to celebrate and have a parade, so it's safe and fun. Like you, tho, I like the colors of the season but tend not to do spooky skeleton/bat/icky stuff! Of course they didn't mind holes in their heads Terri. I mean, look how wonderful you made them look! 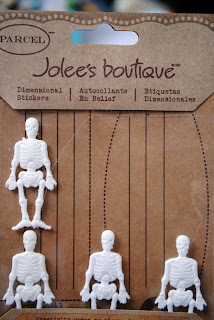 Not every skeleton can look as good as yours - LOL! Thanks for stopping by my blog Terri! Terri, they are so funny-I`m sure your friend will love them. Ohhh these are wickedly beautiful. Love those skeletons. ps, please drop by my blog if you get chance, Theres lots to see including 9 new freebies if you click on the link there. Yesterdy's tea post..i wasn't able to leave a comment or find where to comment..but so enjoyed it..super beautiful! Hi Terri, a friend of mine directed me to your blog. I love it. You are very creative and so generous with information. 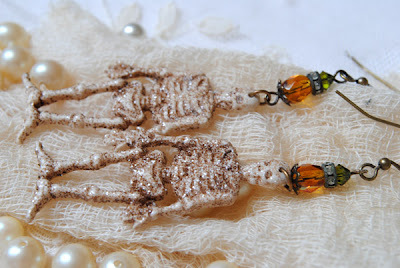 BTW I am not really into Halloween that much but I do like your skeletal earrings. How cute. Love them...such a cute vintage-ey idea! And what will you think up next? You are amazing. The black teacup is lovely. You are having fun!Always enjoy your posts and your style. Oh what a fun project! I've been in the Halloween mode too and am working on a couple fun projects. Hope you're having a great day. Beautiful earrings Terri! Thanks for the inspiration! Super cute earrings! I like a cutesy Halloween myself. Hi Terri.....I stopped by here today and lurked around you blog a little.....in honor of Halloween LOL LOL...anyway....you are so very talented and creative. I just wanted to let you know how honored I am to be on your sidebar blog roll.....it is always a delight to find myself among such talented ladies. Like you, Halloween is a day I tend to overlook...I like harvest decorations, and a porch with pumpkins is attractive & festive...but I don't do spooky. That being said,I like the earrings and know a few people who would appreciate them. Very clever Terri ! These are great Terri! I have those skelletons too. Thanks for the inspiration. Your spooky earrings are fabulous! Great idea Terri! Perfect for Halloween!